Are two photographers better than one on your wedding day? In this article I will outline the pros and cons of both opinions so you can choose for yourself. Two photographers are going to give you more coverage of your wedding day than one. There are many practical reasons why you would want, even need, two sets of eyes on the job. During the course of a wedding, there are always multiple things happening at the same time and they are certainly worth not missing. Greater coverage equals more variety of images and a rich retelling of your wedding day. Two photographers who are familiar with working with each other can get more done in a shorter amount of time. Photographing a wedding can be mentally and physically exhausting. Having a partner to share the load makes for a less stressful and less tiring day. Having your photographers feeling fresh and energetic can only be a good thing for you! Having a dual wedding photography team means more money out of your pocket. At a very small wedding, one could argue that 2 photographers may feel intrusive. Photographers who aren't experienced working with each other have the potential to get in each other's way. Or worse, they may have creative conflicts over who does what. The last thing you need on your wedding day is to have your photographers at odds with each other. Do you really need two photographers? I think the simple answer to that question is "No". While having two may be desirable, the fact of the matter is that there are many great photographer in the world who create beautiful wedding pictures and are killing it all by themselves. Hiring one talented photographer will be less expensive than hiring two. If you are on a tight budget, this alone can be the determining factor. Having one great photographer is worth more than 2 mediocre ones.You may get more pictures, but are they good pictures?Hiring 2 talented photographers is expensive and to compensate, some photography studios will hire students or amateurs as second shooters.Investing in 1 quality photographer would make more sense if this is the case. It is an undisputed fact: One photographer can't be in two places at once, so by sheer logistics a one man/woman show just won't have the same opportunities as a team. While it is possible for one photographer with 2 cameras to capture a wide variety of shots, they can't compete with 2 photographers with 4 cameras when it come to the amount and variety two can offer. Your wedding photographer is going to get tired and need some breaks. This takes them out of the game for you. Is it necessary to have 2 photographers cover your wedding day? Probably not.Many photographers work alone or with an assistant and do an amazing job. Are there worthwhile advantages to having two photographers? Clearly!It's up to you whether these advantage are worth the extra money or not. 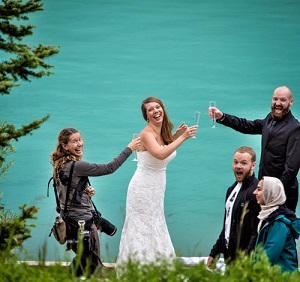 In my humble opinion, it takes two photographers to do a wedding justice.Two photographers can mean the difference between a good job and a phenomenal one!